Tumeur colloîde de la paroi abdominale. Description : 157–160 p., [1 l.] pl. ; ill.: 1 photo. ; 23.5 cm. 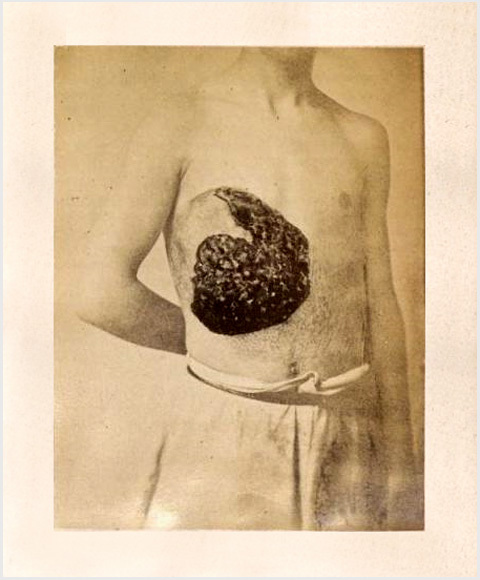 Photograph : hand-colored albumen, mounted to printed leaf, torso of a 26 year-old male. Subject : Thoracic wall — Mucinous carcinoma. Author caption: Observation par M. Angelot, interne..etc. Photo captions: Planche XIX – Tumeur colloide.